WASHINGTON DC, October 15, 2013 – Auschwitz Institute Executive Director Tibi Galis moderated a panel discussion last week that explored how development policy can contribute to the prevention of mass atrocities in post-conflict and fragile states. The October 10 event, “Mass Atrocity Prevention as a Development Imperative in Fragile and Conflict-Affected Countries,” took place at the IMF-WB Civil Society Policy Forum within the World Bank’s Global Forum on Law, Justice and Development. 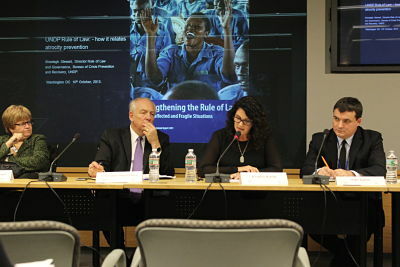 Panelists included (in photo, left to right) Sheelagh Stewart, Director of Governance and Rule of Law, Bureau for Crisis Prevention and Recovery, United Nations Development Program, Ambassador Stephen Rapp of the US State Department’s Office of Global Criminal Justice, and Kristin Kalla, Senior Program Officer of the Trust Fund for Victims (TFV). Galis (right) asked panelists to address challenges–and solutions–towards applying a “mass atrocity prevention lens” to development policy. For Sheelagh Stewart, community safety and security should be prioritized in post-conflict development. “If people don’t feel safe, they won’t invest in their future,” she said. Stephen Rapp argued that accountability should be prioritized over restoring the rule of law in fragile and post-conflict states, especially in places where mass atrocities have occurred. You have to deal with the past before rebuilding institutions, he said. In this way, tribunals are part of prevention–they can prevent conflict from reemerging. Kristin Kalla described how “conflict tears apart the social fabric.” To help thread it back together, you need to have victim input in the design of the reparation process. Otherwise, she said, reparations will not meet the needs of the people they’re meant to serve. The event was promoted by AIPR, the International Criminal Court, and the Budapest Centre for the International Prevention of Genocide and Mass Atrocities, in collaboration with the President of the Assembly of States Parties to the Rome Statute, the Trust Fund for Victims, the US Department of State and USAID.